With all that said, what is Ukulele? What kind of Ukuleles are out there? Where did Hawaiians even find the idea to build such an instrument? These and many other questions are what prompted us to write this extensive article about this tiny acoustic instrument with a huge sound. By the time we are done, you should know everything you need to know about the ukulele. So, where should we begin? There is a lot of ground to cover, hence starting from the very beginning seems to be the most logical choice. Some readers might find the history of Ukelele to be a bit boring, but it’s an important part of understanding what this instrument is all about. With that in mind, let’s start. Back in 1878, Hawaii was one of the few places in that part of the world which were capable of producing large quantities of sugar cane. When new markets opened in California, plantation owners needed to spread their business to meet the growing demand. Because of this, a large number of workers from Portugal started arriving to the island and the Portuguese community grew from mere 1% to a much larger number. As it usually happens, when immigrants arrive, they bring a part of their culture with them. One of those innovations was a small stringed acoustic instrument called machete de braga. It was a simple instrument that featured four metal strings, but the locals simply fell in love with it. That comes as a no surprise since most of the immigrants came from Madeira, and folks from Madeira loved their music. As time went by, now already settled immigrants started modifying the machete. First they introduced some features from other similar stringed instruments which were popular back in the homeland, only to finally form the direct predecessor to the modern day ukulele. The first official ukulele was constructed by three cabinet makers, who wanted to create something new and exciting. Needless to say, ukulele became an instant hit. However, that doesn’t explain why the locals became so fond of it, and it definitely doesn’t give insight as to how ukulele became such a big part of the Hawaiian culture. The explanation for both of these questions is fairly simple, though. King Kalakaua, who was seen as the savior of Hawaiian national identity, but also a great aficionado of arts in general, found out about ukulele and insisted on it being played during royal events. As it often happens, what is cool in king’s court quickly becomes cool outside of it. The story of ukulele from that point in time developed naturally. 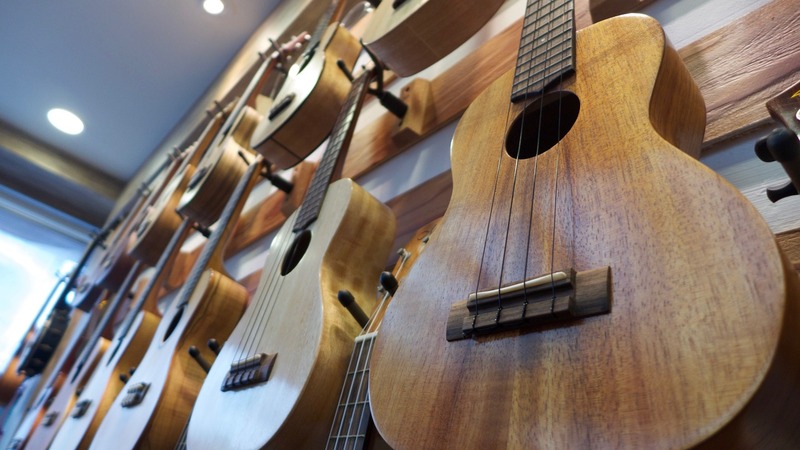 Once it was pretty much established as a national instrument of Hawaii, it didn’t take long before the ukulele craze hit the United States, and later the entire world. Now that we know a bit about how this instrument came to existence, let’s talk a bit about how ukulele works, and what makes it so unique. A lot of folks whose knowledge about stringed instruments ends at the display of their local guitar store have a lot of misconceptions about ukuleles. For starters, they will think it is nothing more but a small guitar. You can’t really blame them for thinking this way, but it’s always good to spread information and educate those who lack knowledge. An ukelele shares a lot of similarities with an acoustic guitar – more specifically the classical variety. We are talking shape, size, principle of operations and generally how the instrument behaves. 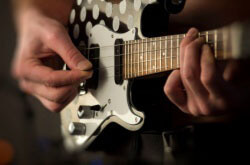 However, ukelele is not only smaller, but it uses a completely different type of tuning, which means different chords and different playing techniques. Whether or not someone who is proficient with a guitar could play ukulele right off the bat is questionable. They might have the general skill in their hands, but would have to start from scratch when it comes to music theory related specifically to this instrument. 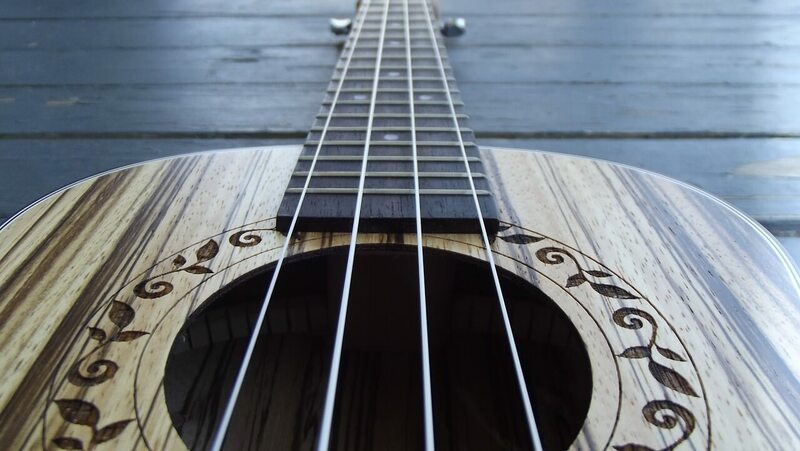 Unlike guitars, ukeleles have four strings and the standard tuning is G – C – E – A. Not only are you missing two strings, but you also have completely different keys on each of those four strings. That means that you simply can’t transfer chords and scales from a guitar to a ukulele. In essence, the ukulele is not just a smaller acoustic guitar that you can tuck in your suitcase whenever you’re going to a vacation. Instead, it is whole different ball game – an instrument that has quirks of its own. With that in mind, building a ukelele takes a special kind of approach. The anatomy of a ukulele is also going to be our next subject. Just like it is the case with most other variations of guitars, ukuleles have three major parts – body, neck, and hardware. Let’s give each of these a quick overview. The body of your average ukulele is going to be shaped like the body of a classical guitar. In simple terms, it’s an hourglass contour with your standard treble and bass bout. Since ukuleles are acoustic instruments, the nature of the body is going to determine the sound that particular ukulele produces. Ukuleles can differ in size, the type of tonewood used to make them and more. We are going to touch upon that a bit later. The neck of a ukulele features a very short scale. We are talking 21 inches on average, but this length can be greater depending on the type of ukulele you are playing. Since it’s a really short scale, the strings that go on a ukulele are special as well. If you play electric guitar, for example, you probably know that you can just go into a store and pick up any type of strings you like. That is not the case with a ukulele. There are two major factors when you choose strings for this instrument. You need to know the length of the strings and you also need to know what tuning those strings are intended for. Even though it sounds complicated, choosing the right set of strings is something that becomes natural after a while. While hardware might be too tough of a word for what we are about to talk about, it is the most practical term to use. By hardware, we generally mean the bridge, saddles, nut and tuning machines. These four components are relatively similar to the ones you can find on a classical guitar, or an acoustic one for that matter. From a purely practical point of view, tuning machines and the bridge are the most important of the bunch. If the bridge is not a quality piece, you are going to run into problems like you would if you played an acoustic guitar with a faulty bridge. Same goes for tuning machines. Even though ukulele’s strings are under much lower tension, it’s still important to have good quality tuners on there, at least if you want to keep your instrument in tune. Much like acoustic and classical guitars, ukuleles come in several sizes which dictate the sound properties you can expect to get. The most common type of ukulele is the Soprano ukulele. Also known as standard, a Soprano ukulele is what most people are going to have. Next is a Concert ukulele which is two inches longer both in scale and length. With this increase in size also comes an additional alternative tuning. Instead of being limited to G4-C4-E4-A4 and A4-D4-F#4-B4, you can now also tune the instrument to G3-C4-E4-A4. Next in line is the Tenor ukulele. This type is two inches longer in scale than the Concert ukulele, but it is actually three inches longer in overall length. Again, with Tenor you also get additional tuning options. Last but not least we have Baritone ukuleles. A Baritone ukulele is 30 inches long and sports a 19-inch scale. Unlike the previous two, this type of ukulele has one common tuning, and that is D3-G3-B3-E34. So, which of these types is the best one to get? The answer to that question depends on what kind of tone you’re after. 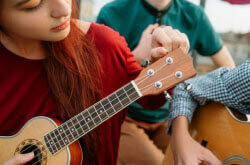 As you go up in size of ukuleles, their tone becomes deeper and the instrument becomes louder. This is pretty much what happens when you enlarge the resonating box of any stringed acoustic instrument. For example, the Baritone ukulele is going to sound almost like a guitar. As a matter of fact, it uses the same tuning you would use for the highest four strings on an average guitar. 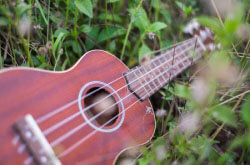 The sound that most people associate with ukuleles comes from the Soprano ukulele. That is also what most people are looking to get. This, however, doesn’t mean that there are no benefits to going larger. That baritone we just mentioned is often times the size of choice for experienced guitar players. If you think about it, having the same tuning as you do on your guitar makes it much easier to transition from one instrument to another. What Makes a Good Ukulele? This is a question that often gets asked by beginners who are just entering the world of ukuleles. The answer to this question is very hard to define. Let’s say that there are two aspects of a good ukulele – you have the materials used, and the skill of the luthier who makes the instrument. In terms of materials, tonewood is naturally going to make the most difference. Pretty much everything that applies to acoustic guitars also applies here. You want good tonewood that has all of the sonic features that you need, and you want the luthier to use solid pieces if possible. Some of the best tonewood for ukulele is Koa, although your standard Mahogany, Maple, and others are also very much present. The deal with Koa is that this wood is what was traditionally used to build ukuleles. It’s native to Hawaii, and its properties have been explored up and down numerous times by now. Finding a solid top, bottom and sides Koa ukulele is probably going to give you the best tonal properties you can get. With that in mind, no amount of highest quality Koa will help you if the luthier who built your ukulele didn’t know what they were doing. Which leads us to our other major factor that needs to fall in place in order have a good ukulele. Many places in the world make these instruments, but no matter who you ask, they will tell you that best ukuleles come from Hawaii. These are going to cost significantly more, but the fact is that luthiers from Hawaii have the knowledge and skills of their predecessors passed down to them. This, in turn, means that you won’t find a person who knows this instrument better inside out than a luthier from Hawaii. Guitars, for example, don’t have this problem, or at least it is not that apparent. 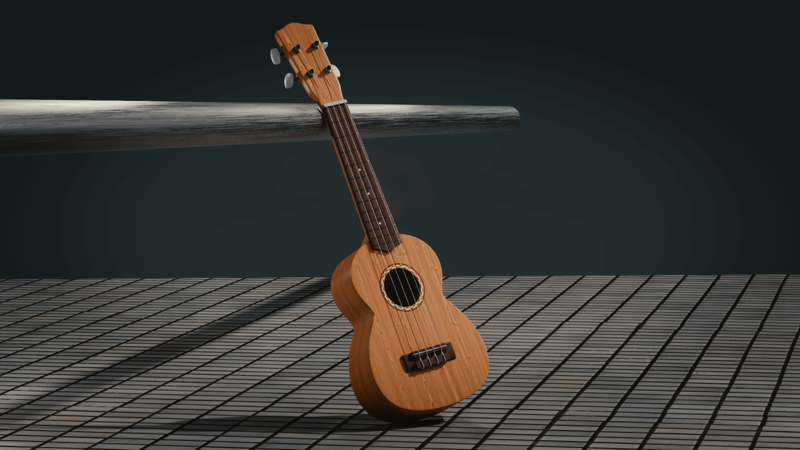 The small size of the ukulele might produce a much higher tone and lower volume than an acoustic guitar, but it leaves the person building it with a lot tighter margin for error. If you make a single mistake while putting together a ukulele, first strum on that instrument is going to reveal it loud and clear. Some of these imperfections are hard to spot if you are just starting out, but an experienced ukelele player will immediately know that something simply doesn’t feel right. The perception of ukuleles in popular culture has given birth to quite a number of misconceptions regarding this instrument. Unfortunately, these straight up false claims are spreading faster than anyone can suppress them. Therefore, it’s important to know what is true and what is not when it comes to ukuleles and playing these instruments. 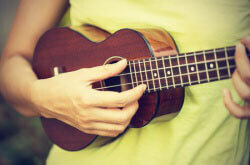 One of the most often heard fallacies is that ukuleles are easy to play. That is just not true. The fact is that people who make these claims have only seen ukuleles being played in Israel Kamakawiwo’ole’s music videos. Israel, as great as he was, rarely played overly complicated shapes and had a style of his own. Now, just because someone doesn’t play the ukulele like Steve Vai shreds his guitar doesn’t mean that you can pick up one of these instruments and instantly start playing. No, it takes time and effort to get to know the instrument and learn all of the chords and music theory that is specific to ukuleles. On a similar note, you will find a lot of misguided parents buying ukuleles for their kids. 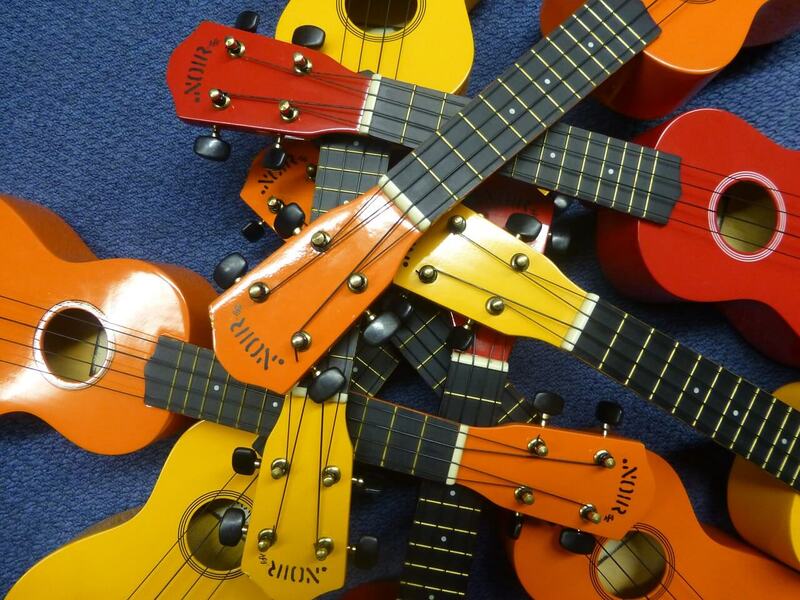 In their mind, ukulele is nothing more than a small guitar for kids. It’s only logical, right? We won’t even go into how wrong this reasoning is, and how detrimental it can be for that kid’s interest in music. What Kind of Music Can You Play On Ukulele? Alright, I can already see some eyes rolling and head shaking. While this question might sound pretty unnecessary, it is a legitimate one. For the most part, ukulele players sometimes get bored of playing those happy-go-lucky Hawaiian beach songs everyone is so crazy about. Exploring the capabilities of a ukulele is something that comes naturally. So let’s talk a bit about what kind of music can you actually play on this instrument. Right off the bat, metal is something that might not work that well. That much is just common sense. However, blues or even jazz are still within the limits of reason. 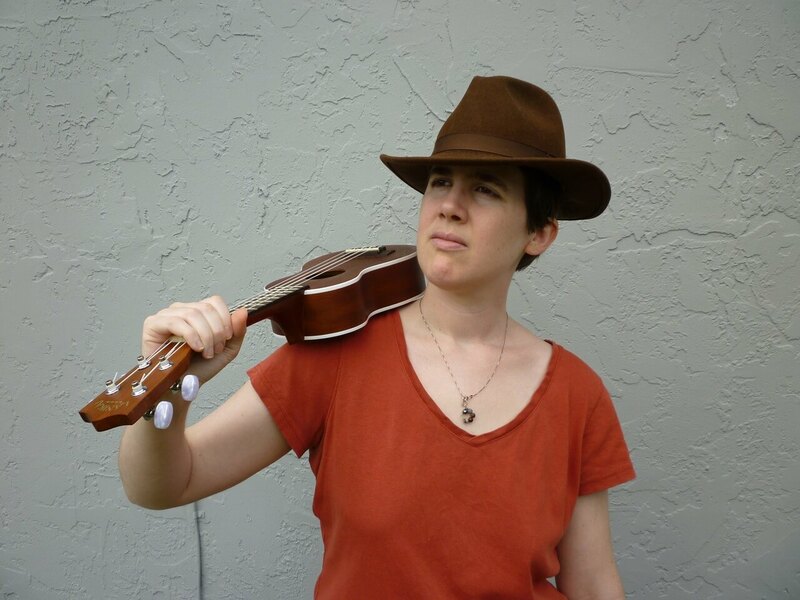 There are ways to translate shapes and licks from a guitar and play them on a ukulele. Since both strumming and fingerpicking are considered to be legitimate playing styles, you can pretty much lose yourself in blues for hours if you are willing to learn how to translate the notes. As most other stringed acoustic instruments, ukuleles exist in an amplified form. Being able to plug one of these into an amp adds a whole new dimension of sound to work with. Not only can you actually regulate the volume, but you can also add various effects. Just imagine what you can do with a decent looper pedal? If you really want to go into unknown territory, add a distortion pedal to your signal chain. Believe it or not, the results can be pretty interesting and fun. The point here is that you shouldn’t limit yourself by what other people are telling you. Instead, explore the limits of your instrument on your own. Ukulele might be small, and it comes across as limited in a lot of ways, but this little instrument is capable of more than most people can even imagine. Is Ukulele Worth Getting Into? From a purely selfish standpoint, it absolutely is. However, that is something you need to figure out on your own. The best way to find out if you might be interested in ukulele is to go to your local music store and play with one for a while. You should do this even if you have never touched one in your life. Just handling it briefly should give you that initial answer. Learning to play ukulele is neither easy nor is it something that you can achieve overnight. With that said, those who start playing ukulele usually get hooked to it after a short period of time. Look at it this way. You have an instrument that can fit in just about any backpack, and it’s every bit as complex as a guitar or other stringed instruments. This increased mobility and the fact that you can practice it on the go is one of the big reasons why the interest in ukuleles has spiked in recent years. On top of that, you can get a starter model for cheap, much cheaper than a decent starter guitar would cost you. If you decide to enter the world of ukuleles, you can expect to become a part of a growing community that takes care of its own. For some reason, ukulele players stick together and help each other out much more than guitar players do. Besides, rocking a ukulele is a surefire way to lighten up the mood at any party or gathering of friends. At the end of the day, it all comes down to you and your personal interests. Ukulele is one of those instruments that are usually overlooked, but still capable of literally putting a smile on someone’s face within moments. People who play ukuleles know exactly what we mean by this. The point of this article was to try and introduce you to the world of ukuleles in a way that you don’t often see anymore. Sure, we started from the very beginning of how ukuleles came to be, but the history of this instrument is important if you truly want to understand where it comes from both in a literal and metaphorical sense. Just the fact that ukuleles are almost exclusively associated with happiness and good times, should be enough to realize the kind of impact this tiny fusion of carefully crafted select wood has in the world. Ukulele is not just something surfer dudes pull out to attract babes, it’s way more than that. Ukulele is a way of life. No matter how overly dramatic that statement sounds, it’s true. 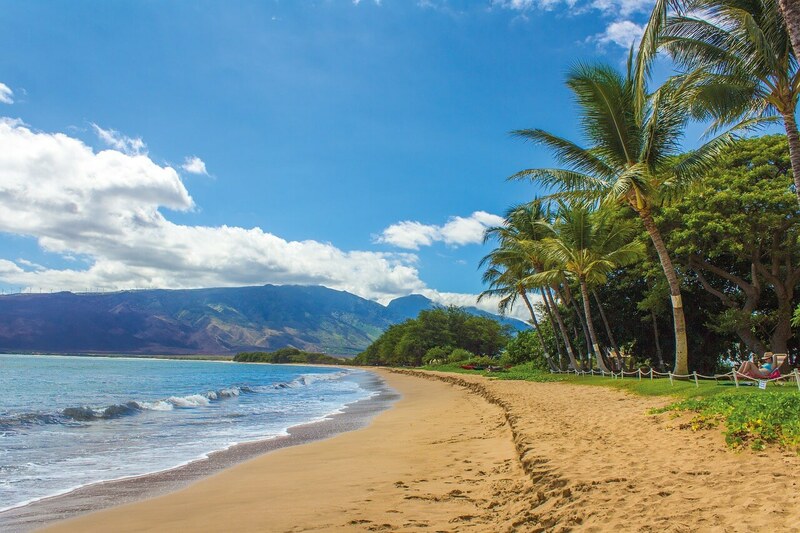 Just step foot anywhere in Hawaii and it you will instantly understand why and how. Thanks for sticking with us today, and hopefully you have learned something new about ukuleles, and their nature in general. If this article sparked an interest in this instrument for you, we urge you to keep researching. There are just so much more things regarding ukuleles that are worth learning about. Rock on!